If you’re missing most, or even a few of your teeth, it can affect how easily you can chew, eat, and speak. Gaps in your smile can also affect your self-confidence. At Sharp Family Dentistry, we believe everyone deserves to live life with a smile they feel confident behind. We provide start-to-finish implant services, which means we can help you achieve a full, beautiful smile without having to refer you out to other dentists. Contact our office to schedule your implant consultation! Dental implants are small titanium screws that we surgically place into your jawbone. The screws are made of biocompatible material and fuse with your jawbone to form strong, artificial roots for your tooth restorations (false teeth). They’re a permanent & reliable method for tooth replacement. Implants look, feel & function like natural teeth. They preserve facial shape to keep your cheeks & lips from appearing sunken. Implants stimulate your jawbone & prevent bone loss. They don’t require additional maintenance — brush & floss them like your other teeth. Before we begin your implant procedure, we’ll design and map out your treatment plan with our smile preview software. 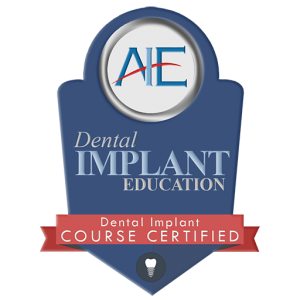 With guided implant dentistry, we can perform more precise and effective implant procedures. Once we’ve created your personalized treatment plan, we’ll put the titanium implants into the predetermined areas of your jawbone. 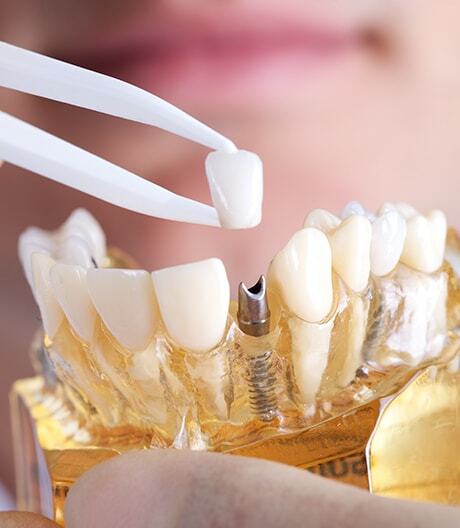 Once the implants have fused with your bone, we’ll attach either a dental crown for single tooth replacement, an implant-supported bridge for single or multiple tooth replacement, or a full or partial denture on top depending on your specific needs.